Designed as a no compromise design the 4644 Drive excels giving the guitarist performance that stands out from the usual devices he may have previously encountered. ULTRA WIDEBAND DISCRETE DESIGN produces transparency and detail that cannot be obtained from conventional op-amp designs. 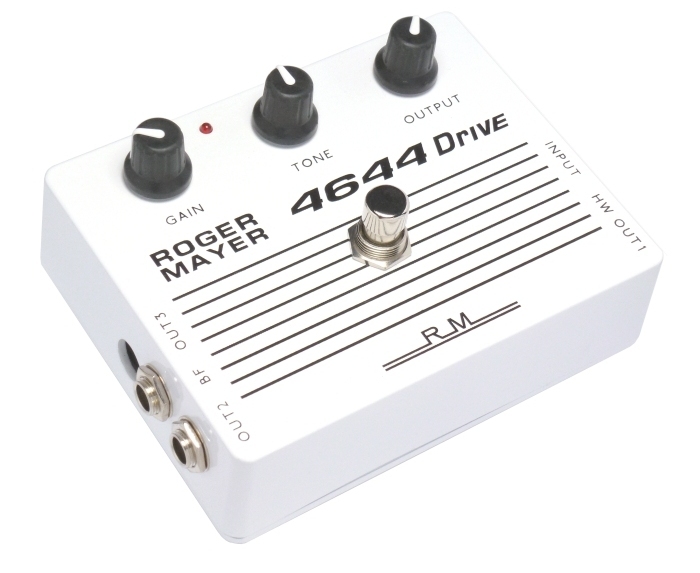 The 4644 Drive harmonics are generated by our PROPRIETARY FEED FORWARD DESIGN with zero phase, time delay or any other nasty artefacts that simply means it is so fast that it will follow and track all your playing techniques perfectly. This optimised series of harmonics produced are very musical and natural sounding over a wide dynamic range. The guitar's VOLUME pot can now be used as a MASTER DRIVE CONTROL when playing without compromising your tone when the volume is backed off. Set the DRIVE once on the pedal and use the guitar's VOLUME making it very performance friendly. A carefully crafted PASSIVE TONE CIRCUIT has been optimised to compliment and adjust the harmonic content for both Single Coil and Humbucker Pickup types used in most guitars and will provide that personal tweek to obtain your perfect tone. The OUTPUT control will set up the overall gain of the 4644 DRIVE to provide a significant boost where desired. The 4644 Drive uses the latest high speed feed forward design techniques to set a new standard in player control and feeling without any latency, misting or blurring of your technique. Your attack and playing nuances will be PRESERVED AND NOT COMPROMISED. The combination of the 4644 DRIVE in front of the 615 SMOOTH are proving to be a marriage made in heaven and are receiving rave reviews from guitarists. The overall TONE and ease of use sets a new pioneering standard of performance that is receiving critical acclaim from professionals World Wide. We have recorded 3 examples of the 4644 being used in different genres to show the transparency and detail that can be obtained in typical recording applications. The setup we used was within the bounds of any small studio setup and all recordings were in 456HD and only the 4644 and 615 were in the chain before the amplifier. No other devices were used or any special trick expensive microphones. We feel the quality produced is second to none and also transfers very well to mp3. Our latest studio products are proving popular with top producers who require an open detailed sound. If you want to record all analogue direct with or without an amplifier check out the AMP+ Series of 3 units that are becoming increasingly popular. 2 sets of audio files: 128Kb/s .mp3 and 16bit/44.1Khz CD .WAV provide audio quality comparison of both original uprocessed and mp3 processed examples. Please check out the differnce and notice how well the .mp3 files sounds when recorded this way. Production and Engineering by SEAN GENOCKEY / ROGER MAYER. The 4644 Drive has a true hard wire output plus two buffered outputs that can drive long cable lengths with no high frequency loss. These buffered outputs are disconnected when the hard wire output is being used. This means that all performance situations are catered for whether you want a true hard wire output or your situation calls for the advantages of buffered outputs.